Unless paratransit, not. For instance, 603 lists (847) 931-6745, which is an Elgin, not Dundee number (same as on the 541 schedule). 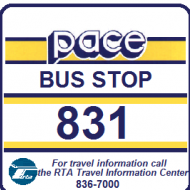 Most of Pace must be on VoIP, as many of the 847-228 numbers are answered in South Holland. Elgin local routes have a different number, (847) 931-6750. 611 uses the East Dundee number. My guess is 612 will be like 611, but with the same vehicle used for midday service. Elgin local routes have a different number, (847) 931-6750. Interestingly, that Googles as the Transit Center (100 W. Chicago St., Elgin), not the garage. The Pace website has the garage at the 45 number. I got the phone numbers off the back of the schedule brochures, -6745 for express and -6750 for local routes. That makes sense because lost items on local routes are probably kept at the TC rather than the garage. By calling the -6745 number, the call could be redirected as needed. 754 might be operated by southwest. I think that because southwest recieved #6381 from river. And i doubt they'd run an mci from heritage or a 30ft bus. Again, post in the correct topic, and very unlikely for the reason @artthouwillsaid above, as Pace is not going to deadhead the 755 from Union Station at 6:53 just to have to deadhead a bus to and from Lockport from Bridgeview. If there is any significance to the move you claim, the Pace board just approved completing the Toyota Park TC. That might result inn more 856 service or the like. But like when 6377 and 6378 were at NS, probably of no significance. Since 612 is an "on demand" service running from 9a-3p, it's probably going to be a para-transit bus. Again we have another effect of someone else posting in the wrong thread. Reread the notice in this topic. There is supposed to be 612 peak hour and an on demand service midday. Route 612 Barrington Rd. Circulator will provide peak-hour weekday service to destinations in Hoffman Estates. Hoffman Estates On Demand will provide prescheduled, curb-to-curb trips in the area bounded by I-90, Roselle Rd., Bode, Barrington Rd., Higgins, and Greenspoint. It will run weekdays from 9 am to 3 pm (no same-day reservations after 2 pm). Following that up, 612 is River, East Dundee, similar as 611. Only one vehicle needed to cover the route. Also following the link mentioned in the schedule to pacebus.com/ondemand indicates that all the C&R routes are being rebranded On Demand, because they won't be just cell phone. Link for this route is here. The Board Chairman noted in the August video that "we have buses on route 53 going back to the garage going right past Lewis," which should put an end to this speculation. I checked out Barrington Road, and it appeared that 16417 runs both routes. It sat around until about 2:15, was gone, and then shot out like a bat from hell at 3:00. The other interesting thing is that while the bus stop is on the south side, the parking lot is on the north, and there isn't any marking on Barrington Road. The entrance and monument sign are on Central Road. It also looks like Bus Stop A is on that side (there is a loop, but no bus). Pace proposing some changes for I-55 corridor. If 856 is a low ridership route worthy of elimination, why reroute a high ridership 855 off route to serve SeatGeek? I don't understand eliminating the Old Chicago Park n Ride stop. Obviously it's very popular. What Pace needs is more buses. Because they spent 2.5Mil on a whole new terminal, they have to serve it with something. What I'm wondering is why 307 hasnt been extended there yet. 386. Perhaps 856 works if it isn't a premium route. If I got on 855 , I wouldn't be Happy with going to 71st and Harlem en route to downtown. 386. Perhaps 356 works if it isn't a premium route. If I got on 855 , I wouldn't be Happy with going to 71st and Harlem en route to downtown. In the interest of connections & the availabity of layover space, I say that for Pace, the 307, 330 & 386 should all serve the terminal, with Harlem/71st being the new terminal for 307 & 330. CTA's 165 & 63W trips to Harlem/65th can also be extended to Harlem/71st. Shouldn't be too hard, since the 330 & 386 (which isn't ending there) runs 30-min headways, the 307 runs 15-mins headways & the 165/63W would only serve it during one peak individually. Probably should also throw some "NO OVERNIGHT PARKING ALLOWED" signs there too and voila. I meant 856 and made the correction. The SeatGeek stop has been renamed to Bridgeview Transit Center with two trips in each direction. The 855 trips that serve both stops leave at the same time as a direct trip from Burr Ridge. And Old Chicago becomes 755 only. Guess Pace is going to rely on those CTA connections for people working downtown. Blue line is at Harrison/Racine, the Pink line is a block away from Damen/Polk and plenty of buses at Union Station, namely the 125. My guess for Bridgeview was that the 850 & 851 were going to pick up trips, but I guess this works too. Old Chicago has always been popular and White Fence was secured years ago as an overflow lot from there. This restructuring is a little more streamlined because having 755 stop at only two stations, the 850’s serve the rest, and Bridgeview reflecting as a deviation of 855 (unsure what were the boardings there however). The timetables should be out by end of week. The 856 replacements on 855 are two additional journeys to the existing timetable starting/ending at Burr Ridge providing additional seats from/to there. The 755 has always only stopped at Plainfield and Old Chicago. Apart from the Bridgeview journeys on the 855, the only other change in stopping pattern is 851 only serving White Fence Farm and not starting from Old Chicago.